This would always be contentious, as I’ve probably heard or read some account of every Star Wars episode praised to the stars and condemned to the garbage disposal of the Death Star. So…. The prequels receive far too much abuse, most of which seems to stem from “They aren’t as good as the first three.” Nothing would have been good enough – memories of Star Wars, even from those of us too young to have seen them at the cinema, are so rose-tinted that we expected the prequels to blow us away, and of course they did not. This is partly because there have been plenty of other huge blockbusters to make us drop our jaws to the floor, such as Jurassic Park, Independence Day and, in the same year as the release of Star Wars: Episode One: The Phantom Menace, The Matrix. That stole much of the thunder from Menace, and no matter how spectacular the prequels were, they were unlikely to give us anything we had not seen before. Episode I: The Phantom Menace has the difficult task of introducing the characters, the setting and the plot points – anyone who says there is “no plot” in this first episode didn’t actually watch it, or at least get it. There is a great deal of plot, in terms of the plotting of Senator/Chancellor Palpatine and the viewer must stay alert to understand how the different threads tie together. The action scenes are as dazzling as anything from the earlier films, but ultimately superfluous: the pod race and the three-way lightsaber battle not really necessary (apart from the death of Qui-Gon Jinn). Certainly the dialogue is wooden, but that is true of all six films, and that can explain the rather stilted performances. Jake Lloyd is rather too young to be unirritating, and Jar Jar Binks is very annoying. But these need not ruin the film – these aspects don’t deserve that much credit. Rather, The Phantom Menace works best as a light-hearted space adventure, as bright as the Tatooine suns, with only vague hints of what is to come. Episode II: Attack of the Clones has the densest plot of all six films (think about it), beginning with dissention in the Galactic Senate and ending with the beginnings of civil war. The various plot lines (romance between Anakin and Padme, Obi-Wan investigating the growing clone army, Chancellor Palpatine’s further scheming) get crowded and can be confusing, so maybe beginning some of these in The Phantom Menace would have worked better. The love story is awkward and stilted, and many events are given insufficient motivation. As usual the action is breathtaking, most obviously Yoda’s lightsaber battle with Count Dooku, but complaining that this is some affront to your childhood is, frankly, narcissistic. Attack of the Clones has a great deal going on, but so compressed are the events that it can be unsatisfying. But of course, it is really only a set-up. Episode III: Revenge of the Sith is the grimmest and most intense chapter of the entire saga (reflected in the UK by its more restrictive certificate). As a piece of epic story-telling, it neatly ties the various strands of the earlier films together as well as setting the stage for the story of the Rebellion in the later episodes. Here there is a balance struck between the resolution of the plot strands, the character arcs and the action sequences (although the final showdown between Obi-Wan and Anakin is rather overshadowed by the environment in which they fight). And much like Return of the Jedi, it really makes use of the real villain of Star Wars, as Chancellor/Emperor Palpatine AKA Darth Sidious demonstrates just how evil the Dark Side can be, proving more sadistic and vicious than Darth Vader ever did. Being prepared to get REALLY dark is Revenge‘s greatest strength, and it stands as a fitting conclusion to part one of the saga. Episode IV: A New Hope is a landmark piece of cinema, possibly the most important and influential film since Citizen Kane. It is also the epitome of why we love cinema, with good VS evil, triumph over adversity, friendship, courage, loyalty and faith proving the strongest weapons against oppression and tyranny. BUT it has archetypal and under-developed characters, a simplistic plot and obvious themes, ropey direction and various contradictions. As a space adventure it delivers on every level and is rightly praised for that. 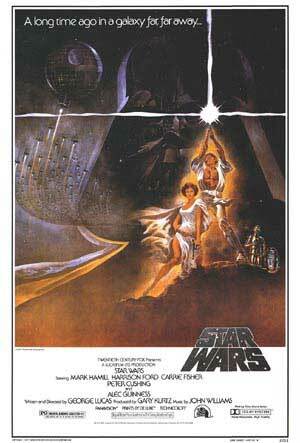 Of the entire saga, it is the only film that stands on its own (hence it was the first one released). But remember, it is only a film. Episode V: The Empire Strikes Back is always praised for being “darker” than its predecessor, which is fair comment, as the bulk of the story involves most of the heroes being chased, captured and tortured, and the other one taking a journey into his heart of darkness (Yoda as Kurtz, anyone?). A somewhat inordinate amount of time is spent in the asteroid field, and the progress through Cloud City seems too easy. That said, non-patronising explanations are provided, and it does feature one of the greatest twists of cinema. After soul-searching on Dagoba, was anyone prepared for THAT revelation? Hardly, and it adds significant depth to the saga as a whole. Episode VI: Return of the Jedi spends too much time on Tatooine, a segment that really has nothing to do with the overall plot, and by this time more focus would be beneficial. The Ewoks may be irritating, but they need not detract from the epic build-up to the final assault on the Death Star, and the true power of the Emperor. The deeper themes begun inThe Empire Strikes Back receive more attention here, with Luke’s serious choices, and although the action on Endor may not be up to the standards of the Imperial Walkers on Hoth, the greater exploration of the saga’s ongoing story makes up for it. But maybe the Force is not with me. By vincentmgaine in Uncategorized on May 26, 2012 .